This hotel is 100pct non-smoking The Hilton Garden Inn Roseville hotel is centrally located just 17 miles north of Sacramento on the way to Reno and North Lake Tahoe. If business is on the agenda hotel is near the offices of Hewlett Packard Enterprise Keysight Technologies and Oracle. The hotel is situated across from the area*s premier water park GOLFLAND SUNSPLASH ideal for families. Other local attractions include world-class golf fine dining and shopping. We*re centrally located easily accessible via I-80 and just 25 miles from the Sacramento International Airport. Love to shop. We*re one mile from shopping at the Westfield Galleria mall. Nearby entertainment options also include theaters and the Fountains at Roseville shopping center. 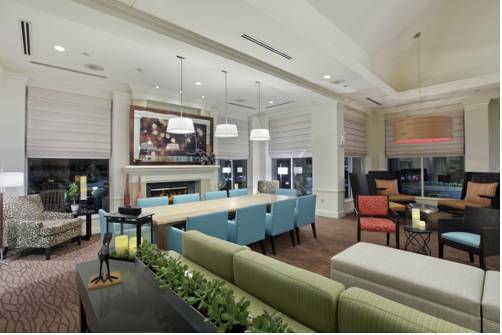 Hilton Garden Inn Roseville is warm and inviting yet elegant and functional. Our amenities include complimentary WiFi HDTVs microwaves refrigerators work desks with ergonomic chairs Serta Perfect Sleeper beds in all king guest rooms and dining at the Garden Grille and Bar. Other features include an outdoor pool and whirlpool spa 24-hour fitness center 24-hour complimentary business center and free parking. The hotel is a 100 smoke-free facility. The Garden Grille - Dinner: In the evening the Garden Grille - Bar features uniquely-prepared American cuisine available in the dining room or through room service. Open every night from 5pm to 9pm. The Pavilion Pantry: Take-away meals. The Pavilion Pantry offers an assortment of refrigerated or frozen microwaveable packaged items that guests can prepare using their in-room hospitality center including microwave and refrigerator. Open 24 hours.